Want to work together and make magic happen? Hop on over here. What if you’re addicted to beauty products and turn out to be allergic to all of them? It happened to me, seemingly overnight. A horribly red, itchy rash across my face turned out to be the sad breaking point of fighting eczema for years. My skin had had enough. Even though I was already using good quality hypoallergenic brands, it wasn’t enough to keep my skin problems away. Desperate, I turned to a DIY remedy I had read somewhere online. A simple oatmeal face scrub. Sure, I was skeptical about the idea of putting my morning bowl of oatmeal on my face. But there wasn’t possibly anything I could do to make it worse. So I made a paste of oatmeal and water and massaged my face with it. The result changed my life forever. Just like a steaming bowl of porridge on a cold winter morning can feel so comforting and good, this DIY face cleanser made my skin feel soothed and balanced. Now, there’s one important thing you need to know before I continue my story: this was before there was a LUSH store anywhere close to where I lived (they didn’t even have an online store back then!) And other organic and natural brands were scarce to say the least. So now that I had discovered this love and passion for natural beauty, I had to figure out how to create a skin care routine all on my own. With supplies I already had. I raided the kitchen pantry A LOT from that point on. After I finished college and had to try to figure out how to be an adult, I decided to start something of my own. I wanted to share what truly made me happy. As my craft projects had become my personal therapy sessions, I decided to start a craft blog. 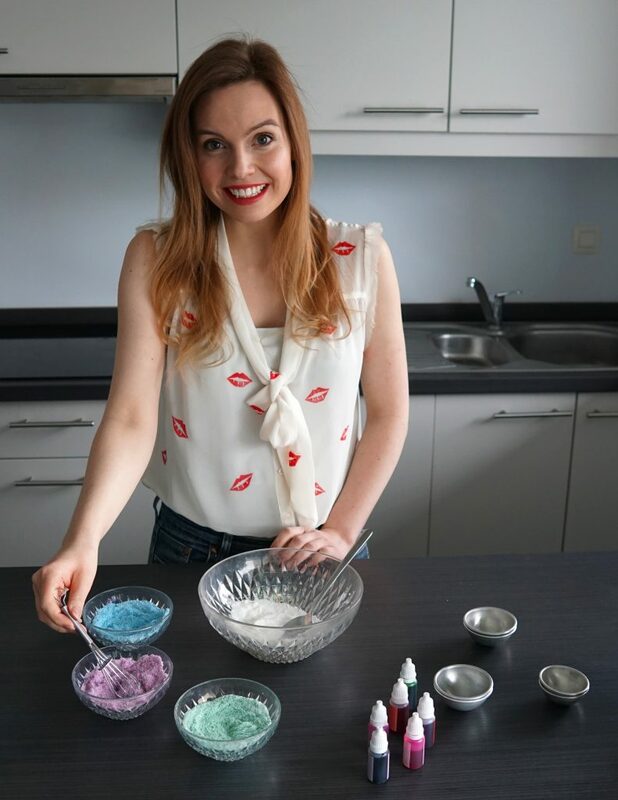 Soon I also started to share the DIY beauty products that had changed my life. The response was overwhelming. As it turned out, I wasn’t the only one who wanted to put food on her face. There seemed to be a lot of interest in LUSH inspired DIY tutorials too, and that’s how I started to share bath bomb tutorials. I’m not a cosmetologist, physician or other health care professional. I have tried and tested every single one of these recipes and DIYs on myself. However, everyone reacts differently to certain products. Therefore, I cannot be held responsible for any bad reactions, mishaps or fashion faux pas. Read my full disclaimer & disclosure here. I was diagnosed eczema when i was 5, today i’m 22. It doesn’t go better, particularly my hands go worse and so dry, it looks like 50 years old lady hands (sorry for saying that..), but i really want to know how you cure that and how you maintain not recur. I have been reading you blog, that’s great ideas and awesome, so keep being awesome! And thanks for the great content. Hi Joanna, that’s so so sweet thanks! YOU are awesome! With my eczema I’ve found that moisturizing is key. Also try to find out what is causing your issues. For me it’s an ingredient (I’m not sure which one) that’s in a lot of store bought skin care and makeup products. For your hands I would recommend wearing gloves as soon as you go out (especially now that it’s fall) and putting on hand lotion all day long. Also avoid washing your hands and doing dishes when you can 😉 Let me know if you see any improvements! I hope it gets better soon! I am a huge fan of your blog and all of your DIY’s! I was wondering if you could do a copycat recipie of Lush’s hot oil hair treatments? I love them so much but they are so expensive! Can you duplicate lush cosmetics Shangri La? Love ur many tips on DIY Lush products! I looove loove Lush, especially the Rub Rub Rub salt scrub! Thank you for posting! Do you think you can experiment and post the proportions needed to make Lush’s Outback Mate Soap fragrance? I am crazy about the scent, but I don’t just want soap, I want to have lotion with the same scent! Thanks in advance! Hi there! I’m a first timer to making bath bombs but absolutely want to give it a try! I also wanted to make some that were kid friendly! Not real sure of the difference when made for kids. Any recommendations? I took a look at some of your recipes, and I’m happy to say I will be trying a lotion recipe soon. Can’t stand commercial body and face lotions, so I’m willing to try some EASY homemade. I’ve viewed other homemade blogs; but they also hv become increasingly difficult to reproduce, with a list of ingredients that would erase whatever bank account I have! Simple is for me! Hi! I can’t seem to find your DIY Lush R&B dupe…please help! Hi Cierra! I just updated the recipe. You can find it here: https://www.themakeupdummy.com/diyhairbalm. Thank you for DIYing with me!